View More In Water Cooling Systems. 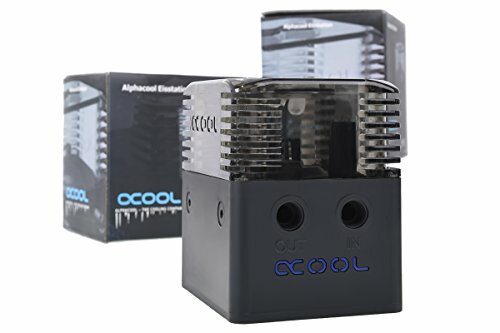 The Alphacool Eisstation reservoir is extremely compact and is available in three versions suited for different pumps. D5, DDC and DC-LT versions are available. Each pump is installed in the bottom of the Eisstation and is not visible from the outside. The bottom of the Eisstation is a metal plate that reduces vibrations and increases the stability of the Eisstation. Mounting possibilities The installation options are numerous and comprehensive. The Eisstation can be screwed onto a 2.5" SSD bracket. It can also be mounted in a 5.25" bay. In either case, the special decoupling screws included with the Eisstation are used for mounting it. This minimises the transfer of vibrations to the case, lowering the operating volume significantly. Another installation option is the included Velcro fastener. One part of the Velcro is glued to the bottom of the Eisstation, while the other part is glued to the case. Then all that's left is to press the Eisstation's bottom against the corresponding Velcro on the case. The size of the Velcro ensures secure positioning even during transport. The Eisstation can be mounted vertically or horizontally, depending on personal taste and available space. Connection possibilities There are four possibilities for connection. An IN and an OUT with G1/4 threads are located on the top, with the illuminated logo. The logo's colour can be changed with the optional modding kit. In the cap, there is one G1/4" and one G3/8" connection available. The G3/8" connection, with its larger size, simplifies filling the Eisstation and can also serve as a lighting module for 5mm LEDs. Two additional 5mm LED places can be found in the bottom of the reservoir and illuminate the water-filled portion from below. Technical Details Dimensions (LxWxH): 102 x 82 x 105mm Material: Nylon / PMMA In / Out: G1/4"
If you have any questions about this product by Alphacool, contact us by completing and submitting the form below. If you are looking for a specif part number, please include it with your message.